For battery powered applications, we offer load switches with as low as 10nA of shutdown current. Find the package option that works best in your manufacturing environment. Integrated load switches from the TPS229xx family are integrated electronic relays used to turn on and off power rails. Most basic load switches consist of four pins: input voltage, output voltage, enable, and ground. 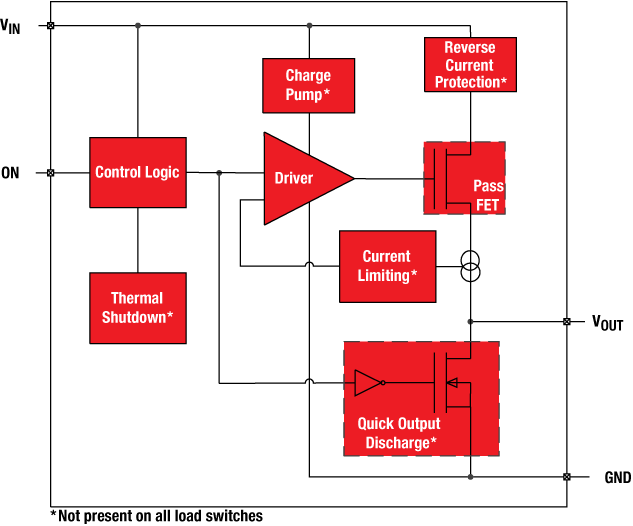 Shown below is a block diagram of a basic load switch. For a higher level of input or output power protection, check out our eFuse devices, which include features such as overvoltage shutdown, current limiting, and short circuit protection. The pass FET is the main component of the load switch, which determines the maximum input voltage and maximum load current the load switch can handle. The on-resistance (RON) of the load switch is a characteristic of the pass FET. The gate driver charges and discharges the gate of the FET in a controlled manner, thereby controlling the rise time (tR) of the device. The control logic is driven by an external logic signal. It controls the turn-on and turn-off of the pass FET and other blocks, such as quick output discharge (QOD), the charge pump, and blocks with protection features. The charge pump is used in load switches with an N-channel FET, since a positive differential voltage between the gate and the source is needed to turn on the FET. Quick Output Discharge (QOD) is an on-chip resistor from VOUT to GND that is turned on when the device is disabled via the ON pin. This will discharge the output node, preventing the output from floating. Additional features are included in different load switches. These include, but are not limited to, thermal shutdown, current limiting, and reverse current protection. Learn fundamental basics of what load switches are, when they should be used, and how they can be implemented in a system. With an integrated load switch you can reduce solution size by 90% and greatly simplify the design process. These short videos explain what challenges you can overcome with an integrated solution. Personalize your training experience by accessing advice and support from the integrated load switch experts. Explore our on- demand training videos, application notes, reference designs and more.